The Orient Express? In SPACE? How is that not awesome? It’s a train in space! Ok that’s a little silly. And I guess we’ve seen this idea of transportation in space before (Voyage of the Damned?) but this was pretty great. In fact I’d say it’s the best episode of the series so far. And it’s been a strooong series. The episode begins with an old woman being murdered by a mummy. The twist? Only she can see it. The Doctor and Clara arrive shortly after, which was odd, considering the ending of last episode. 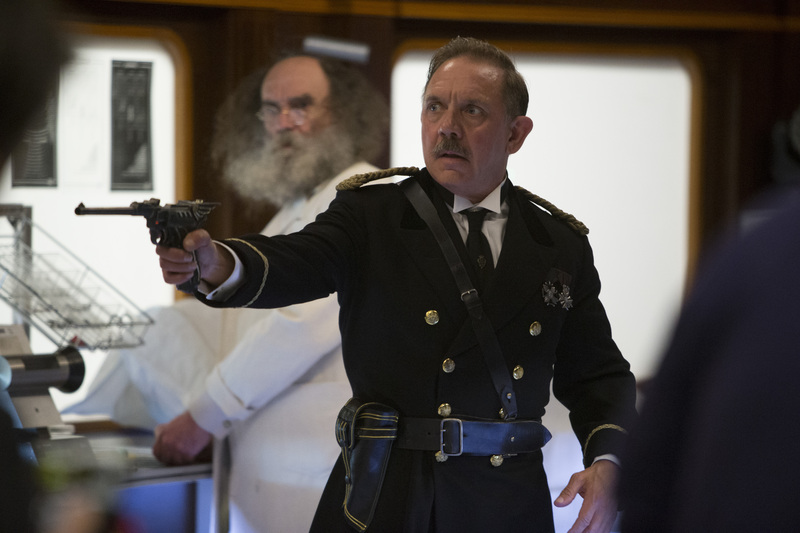 You soon learn that this harmless trip aboard The Orient Express is The Doctor and Clara’s ‘last hurrah’. You also soon learn it’s not going to be a relaxing trip. The mummy is an ancient creature called “The Foretold”, or so they think. 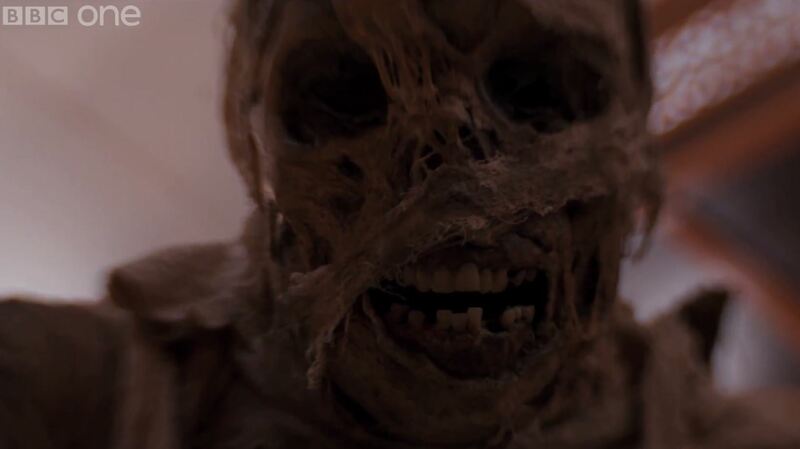 The mummy itself looks really cool, and the way it kills people is especially cool. Once the victim has seen it they only have 66 seconds left in which to live, which makes for some frightening scenes of people screaming and begging for their lives. Hopefully this got some of the younger viewers hiding behind the couch, a few people I watched it with shuddered at some scenes. The episode overall felt Agatha Christie-esque, with The Doctor taking on the role of Hercule Poirot. It is certainly better than ‘The Unicorn and the Wasp’. The mystery of the mummy kept the episode very interesting kept the episode on track towards the conclusion. Perhaps the overall reveal of what the mummy really was, was perhaps a little rushed, but for me it worked. The origin of it made sense and the way they dispatched it worked well. And in the end ‘The Foretold’ was not the real villain. That honour goes to the AI that ran the train; Gus. Voiced by John Sessions, he was really great and felt like something straight from Bioshock or Fallout. The aesthetic is brilliant in this episode, the train looks like something straight out of the 1930’s with a few futuristic touches. Everyone is dressed in suits and dresses and it may just be the classiest episode of Doctor Who yet. The slow version of Queen’s ‘Don’t Stop Me Now’ by Foxes that played over the opening scene was genius, and really set the feel. The direction remains outstanding too. I say this each week but this series looks great, more on par with high budget US shows. The special effects are great too. Peter Capaldi is wonderful of course. As the rest of this series has shown us, he is really great. Like last episode The Doctor’s moral compass is called into question, although he shows a nicer side of himself in this one. Jenna Coleman is really good, if perhaps a little underused. Then again. I had no idea she was even in this episode. Also her sudden turnaround was quite sudden at the end but we’ll see how they deal with that next week. Also in this episode was Frank Skinner. At first it was a bit jarring seeing him in this world, but then you sort of get used to it, and he acts as a friendly face throughout the episode. This episode was GREAT. My favourite so far, and there has been some really good episodes this series. It balanced the humour, the tension and the drama really well and managed to fit them into a tense and thrilling 45 minutes. It was also just a really interesting setting, I loved seeing the art deco style, I wanted to know everything about this train and the people on it. All of the elements came together so well. This episode scores full marks from me.